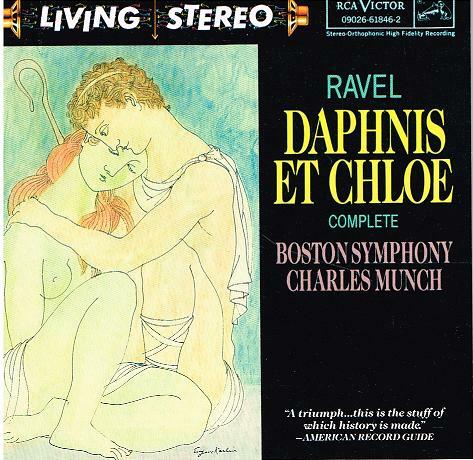 "Since its release in the 1950s (first as a mono LP and then in its true stereo incarnation), Charles Munch 's account of Ravel's DAPHNIS ET CHLOÉ has been the standard bearer. For years classical fans loved to say that the Boston Symphony under Munch was the world's greatest French orchestra, and whether you believe that or not, it is impossible to argue against him being one of the great interpreters of French music. This disc is one of the jewels in RCA's 'Living Stereo' series, and it is guaranteed not to disappoint." 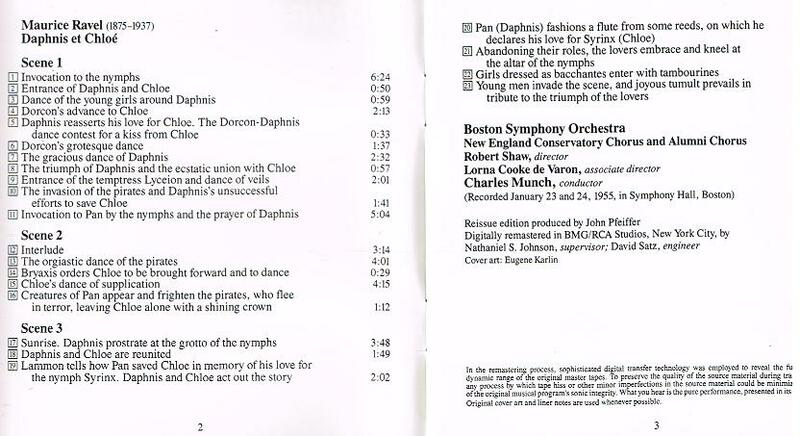 "Munch recorded this gem with the BSO twice for RCA. Two different producers, and two different engineers. Lewis Layton who, along with Bob Fine at Mercury, set the standards for early analog stereo. They were very much the Toscanini and Stokowski of the mixing boards. This disc is a re-release of the stereo 1955 version which in LP was only released in mono, but in a very deluxe fold-open jacket with book and illustrations by a then unknown Andy Warhol. Munch's performance is astounding in every sense, and the BSO responds brilliantly."